Authorities arrested four suspects this morning in connection with three fires on the University of Northern Iowa campus. UNI Public Safety director Dave Zarifis says he’s pleased to finally announce arrests in the case more than 15 months after the fires, one of which heavily damaged a critical building on campus. Zarifus says "We worked with West Des Moines Police Department this morning (in making) two arrests in West Des Moines and then two arrests were made in Cedar Falls with the assistance of Cedar Falls Police." 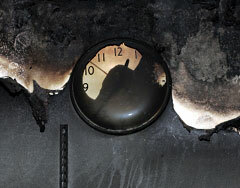 The early-morning fires set in October of 2005 in Lang and Baker Halls did minimal damage, but the blaze at Gilchrist Hall, the main administration building, was extensive. That building is still closed and the restoration bill is expected to exceed ten-million dollars. Zarifus won’t discuss a motive, saying, "I’m really not going to get into any part of the investigation or how things came to fruition other than the immediate information that was released." He says the Gilchrist Hall fire was a particularly hard blow for the campus. Zarifus says, "It was in the administration building so it affected a lot of departments within that (building) and the students who did business within those departments and as of yet, we’re still not back into that facility."